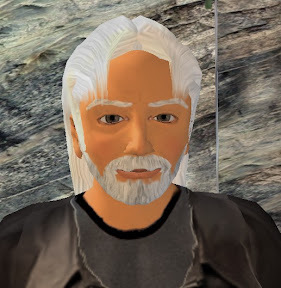 My good friend Aleister Kronos was telling me today that he’d been playing with a Skype phone, intending to use it to chat within Second Life. We have a mutual friend somewhere in a different (RL) continent who has recently enrolled with Skype, but who hasn’t yet invested in a handset. Both parties have the necessary in-world headsets to initiate voice communication. But hold on….. Aleister is now hesitating over whether or not to make the call. He’s been quite happy using Chat, IM and e-mail to communicate, but there’s something a bit odd about the idea of using “real” voice communication. Something doesn’t feel quite right…. There seems to be the chance of ruining a beautiful friendship! So what is it about chat that is so good? Similarly, why do teenagers insist in using SMS text messages rather than speaking to their friends? Perhaps it is that Chat (or IM) keeps the interaction remote. The Avatars on screen show a virtual presence, but the keyboard and screen provide a protective barrier between correspondents. Switch to voice, and the person at the other end of the line becomes that bit more “real” and so able to inflict pain, or shatter an illusion as to their real persona. Then again, the keyboard slows down communication, allowing time for consideration and refinement. How many times in spoken conversation do we blurt out a response and then wish we’d engaged our brains before putting our mouth into motion. Few people are so adept at touch typing that they do not have to check what they have typed…. And so inevitably have to read and consider what they are about to send, allowing tempers to cool slightly or responses to be moderated. Finally, there is the concept of attention span…. You have to concentrate 100%, in real-time when having a spoken conversation. You do not have the opportunity to “rewind” the conversation if you were not listening or were otherwise distracted. With written (chat or IM) conversations, you can leave the thread for a while (seconds, minutes, hours even) before picking up conversation once more. You can go back and review what has been said. There is no question about what was said – there is an unambiguous audit log of the whole conversation. Despite these advantages, it appears that Linden Labs are currently working on voice integration within SL. So soon it may not be necessary to procure a Skype (or other) external voice account. We will be meeting people within SL and chatting to them by voice directly…. Just like in RL…. But then, as I have noted in an earlier posting, we don’t actually speak to people so readily in RL…….. so will the introduction of voice be a backwards step? Or will residents still insist on using “old fashioned” methods of communication via keyboard? Only time will tell. I think both will be used: voice would be great in some settings, but it won't replace chat or IM. You've listed all of the reasons why.